Drug-related deaths have reached a record high in England; there were 2,383 drug misuse deaths registered in 2016, of which 1,867 involved an opiate1. Naloxone, a medication that can save the life of someone overdosing, is cheap, and has no potential for misuse, so it is imperative for local authorities to provide it to people who are at high-risk of experiencing or witnessing an overdose. Yet, research undertaken by Release has shown that the provision of naloxone is wholly inadequate, with a lack of sufficient coverage and significant barriers to accessing this medication. 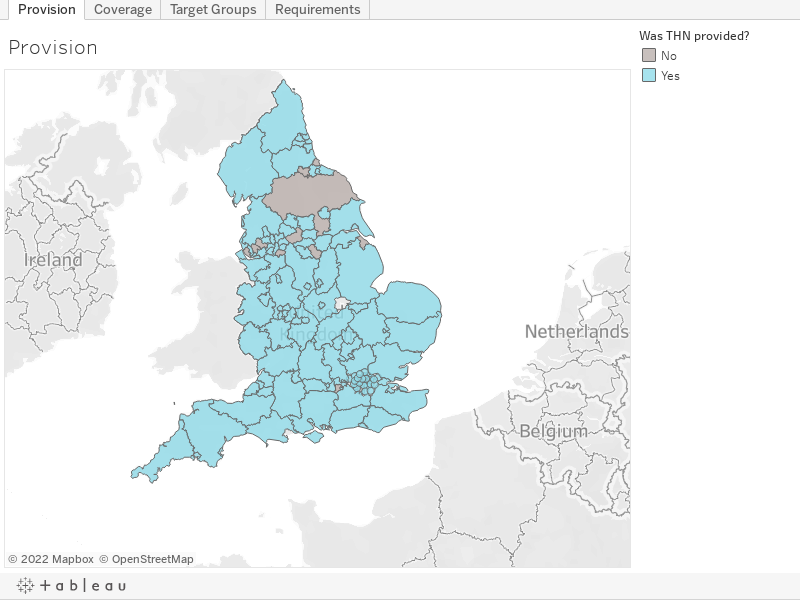 We have provided an overview of the state of naloxone provision in England in the map below. The findings show that there must be an urgent and coordinated response to this problem, which is why the UK Government must initiate a national take-home naloxone programme. At the very least, the Government must better support local provision of take-home naloxone (THN) to prevent more unnecessary deaths. To map out and assess the provision of take-home naloxone in England, Release requested information from all local authority areas under the Freedom of Information Act 2000 through a self-completion questionnaire, as local authorities are responsible for commissioning drug treatment services. Out of the 152 local authorities in England, 99% of areas responded to the questionnaire (n=151) and only Waltham Forest did not provide a response (n=1). Responses were collected between August and October 2017. Our analysis of the results is under the map below. Please refer to the Tableau dashboard for a breakdown of the responses by local authority area. Provision: Responses were collected from local authority areas between August and October 2017. It has been noted where a local authority area has indicated that it had plans to provide take-home naloxone (‘THN’). Coverage: Coverage was measured by the number of THN kits dispensed per estimated opiate users in a local authority area. Of 152 local authorities 117 provided the number of THN kits given out in 2016/17 (86 areas provided the cumulative number of THN kits given out between 2014/15 and 2016/17). Local authority areas are coloured according to the number of THN kits given out (per 100 people using opiates) in the 2016/17 financial year on a coverage scale from 0% to 100%. Where a local authority provided us with the cumulative number of THN kits given out between 2014/15 and 2016/17, this coverage figure has been noted. Where a local authority did not provide information on the number of kits given out, this has also been noted. Target Groups: Target groups for take-home naloxone provision were identified as: Clients accessing Needle and Syringe Programmes (NSP), Opioid Substitution Therapy (OST) patients, and family/friends/carers of people at risk of overdose. Local authority areas are coloured according to the number of target groups that they provide THN to. Where a local authority area identified other groups provided with THN, these have been noted. Requirements: Potential barriers to accessing take-home naloxone were identified as: Referral to a THN provider, Booking and attending an appointment with a THN provider, and Assessment with a THN provider. Local authority areas are coloured according to the number of potential barriers to accessing THN in their area. Where a local authority identified other requirements to accessing THN, these have been noted. Coverage was between 20% and 49% in 26 areas. Among these 117 local authorities, a smaller number – 86 – provided us with the cumulative number of take-home naloxone kits given out for the three-year period between the 2014/15 and 2016/17 financial years. We requested information from local authorities to estimate cumulative coverage during this period since an October 2015 legislative change commissioned3 drug treatment services to provide naloxone “directly to individuals without the need for a prescription”4. Among these areas, and during this period, only 21 take-home naloxone kits were given out for every 100 people using opiates (equivalent to only 21% cumulative coverage). Given that the shelf-life of Prenoxad (injectable naloxone) purchased for distribution is 36 months from the point of manufacture, coverage will be overestimated in these areas because some of the take-home naloxone provided over this period will have expired5. 24% (37) do not provide take-home naloxone kits to family, friends, and/or carers of “at-risk” individuals. 20% (28) require a person to be assessed by a take-home naloxone provider. These requirements can prevent people who need naloxone from accessing it. This is particularly harmful for groups that already face significant barriers to accessing drug services, such as women6, people of colour7, and young people8. Additional requirements to access take-home naloxone were identified from questionnaire responses, such as the requirements to complete training on naloxone administration, to verify the person’s age, and to safely store take-home naloxone. Efforts to widen the availability of naloxone9 should be commended, and the increasing number of local authorities providing take-home naloxone10 is undoubtedly a step in the right direction. However, local authorities need to urgently address concerns about the extent and accessibility of take-home naloxone provision in their area to prevent further mortality. Recommendation 1: Take-home naloxone should be provided in every local authority in England. Recommendation 2: Local authorities should be giving out at least one take-home naloxone kit for every person using opiates in their area. Recommendation 3: Local authorities should make take-home naloxone available to any person requesting it, particularly to groups that are at risk of having an opiate-related overdose or are likely to witness someone having an opiate-related overdose. Recommendation 4: Local authorities should remove any unnecessary requirements to receive take-home naloxone, particularly requirements to engage with services providing take-home naloxone. Recommendation 5: Local authorities should monitor take-home naloxone provision in their area, including by recording the number of naloxone kits purchased and dispensed, and by monitoring expiry dates of naloxone for recalls and reissues. Recommendation 6: Support and guidance for local authorities on the local provision of naloxone should be provided nationally in England as a matter of urgency to assist in co-ordination and monitoring of provision and gaps. Any queries about the data should be addressed to Zoe Carre. 2. National Services Scotland (2017) National Naloxone Programme Scotland: Monitoring Report 2016/17, http://bit.ly/2zzWHWY, 29-31; Hay et al. (2017) Estimates of the Prevalence of Opiate Use and/or Crack Cocaine Use, 2014/15: Sweep 11 report, http://bit.ly/2fRr7fi. 5. Whilst every effort should be made to use naloxone that is in-date, if only expired naloxone is available in the case of an overdose, it should be administered in the absence of an alternative as it will cause no harm. 6. International Narcotics Control Board (2017) Report 2016, http://bit.ly/2vmuT9H, 7-8; Greenfield et al. (2007) ‘Substance abuse treatment entry, retention and outcome in women: A review of the literature’, Drug and Alcohol Dependence, 86: 1-21. 7. Sangster et al. (2002) Delivering drugs services to Black and minority communities, Home Office Drugs Strategy Directorate, http://bit.ly/2kdFKPq. 8. Wareing et al. (2007) Young People and Substance Misuse: Characteristics, Needs and Perception of Treatment Services of Drug Users aged 18 to 25 in Liverpool, http://bit.ly/2AdFypf; Carre (2017) Why are fewer young adults presenting to treatment for substance mis/use in England?, MSc Dissertation, The London School of Economics and Political Science, Social Policy Department.